In pursuit of customer satisfaction, Foltz Trucking takes pride in the experience and dedication of its staff. It’s their hard work and commitment that results in cost effective shipping for you across the state or across the continent. Another word for service is FOLTZ. Foltz is a family owned business started in 1958 serving grain elevators in the Dakotas and Minnesota. 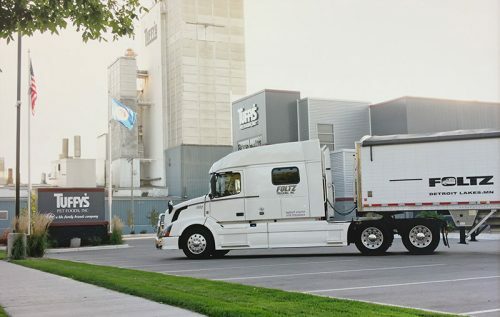 Today it has expanded to serve customers throughout the United States and Canada moving a wide array of bulk materials including: Soy Meal, Malting Barley, Spices, Grain, Cotton Seed, Canola Meal, Edible Beans, Rice, Corn Meal, Sunflower Meal, Potatoes…the list goes on and on. No matter what you need moved in bulk shipment, Foltz Trucking can handle the job safely and efficiently. Our fleet is made up of modern equipment. Equipment that is matched to your needs to ensure your freight is delivered when and where you want it. It is important to us that every shipment is handled safely and securely every step of the way. At Foltz Trucking we are committed to our customers with Reliable On Time Service, Modern Equipment, Continual Staff Training and Upgrading of Employee Performance Standards, Competitive Pricing and a Superior Safety Record.